April 6-8 - Labor Notes Conference, Chicago, Illinois. (Book tabling and book & author event). January 14-16 - UPTE-CWA Education Conference: Marriott Hotel/Visalia Convention Center, 300 South Court, Visalia, California, 93291. January 24 - Western Mass. Book Discussion in Greenfield Public Library, 402 Main St. Greenfield, Mass. 01301 Sponsored by Franklin County Continuing the Political Revolution. *Strategy Session with Somerville, Mass. Activists. Jan. 29 - Brooklyn, NY. Panel on “Socialists in The City,” 3 to 5 pm, Starr Bar, 214 Starr St., Brooklyn, NY. Co-sponsored by Working Families Party and NYC Democratic Socialist of America. With Nelini Stamp, WFP organizer. Feb. 3 - Richmond Rotary Club, 12:30 P.M., Richmond Country Club, Richmond, CA. Feb. 24/25 - Mendocino, CA. Events - Friday, Feb. 24, 6:30 to 7:30 P.M. at Gallery Bookshop, 319 Kasten St. (corner of Kasten and Main St.), Mendocino Village, CA. 95460. Introduced by Cal Winslow, Mendocino Institute. March 6 - Chicago Book Discussion: 6 P.M. at 57th Street Books, 1301 East 57th St. Chicago, Illinois, 60637. March 15 - Richmond, CA event at Atchison Village Mutual Homes Corporation, 7 P.M. AV Hall, Richmond, CA. March 16 - Friends of the Earth, book-related presentation to national executive board, Berkeley, CA. March 19 - Portland, Oregon book event at First Unitarian Church, 1211 SW Main St., Portland, Time TBA. 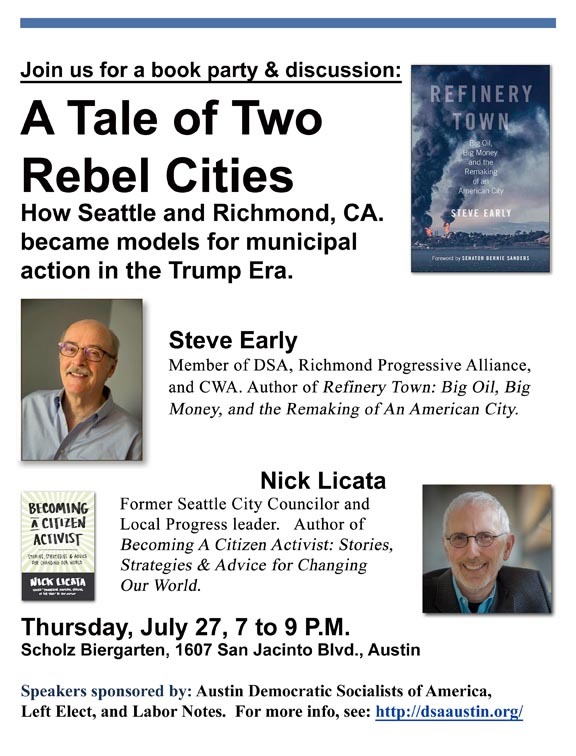 Co-sponsored by Alliance for Democracy and Economic Justice Action Group of First Unitarian Church. For details, contact: davidafd@ymail.com. March 30-Point Richmond Business Association, Book Presentation and Discussion, Noon to 1 P.M, Up and Under Pub, 2 West Richmond Ave., Richmond, CA. April 21 - San Francisco, CA. : 1 to 3 P.M. Presentation at : "Environment and Our Health: What's the Connection?" educational conference for SF General nurses and other public health care workers, sponsored by SEIU Local 1021. At SEIU Local 1021 main office, 350 Rhode Island Avenue, San Francisco, CA. 94103. April 23: Los Angeles Times Festival of Books: 10:30 AM to 12 Noon, Author panel entitled "Environment: Surviving the Future?" in Hancock Foundation Room, USC Campus. For registration information and directions, see: http://events.latimes.com/festivalofbooks/. 220 Pacific Avenue, Rodeo, CA. 94572. Open to the public. April 27: SF Progressive Democrats of America Forum: "Can Richmond be a model for progressive electoral activity in the Trump Era?" 7 P.M. at Unitarian Universalist Center, 1187 Franklin St. (Corner of Geary Blvd. ), San Francisco. Richmond City Councilor Melvin Willis will participate in the discussion. June 3-4 Left Forum, New York City. Book related panels both days--see schedule below-- and book signing. October 4: Western States Petroleum Association Issues Conference, Panel on "Engaging Locally, Regionally, and Across the West," Monarch Beach Resort, Dana Point, California.